Bella Goth's brother, a Maxis character who appears in all three Sims games, but is practically a different person in each one. 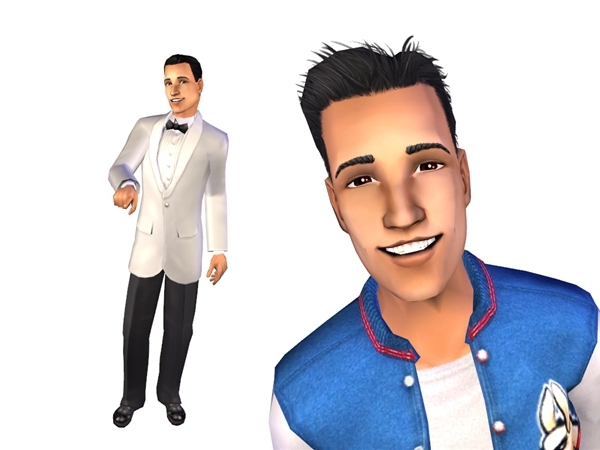 In TS1, he's a young guy just out of college with black hair and olive skin. 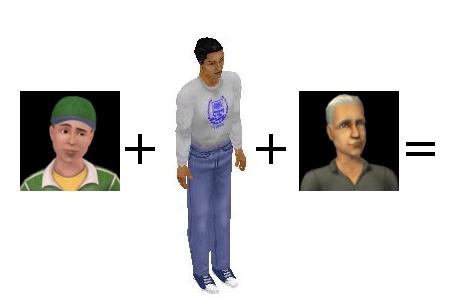 25 years before that, in TS3, he's a teenager with light skin and brown hair (Thus retconning TS1 Michael to being almost forty) In TS2 they slapped his name on a face 2 template. I decided to combine all three of them and create the Ultimate Michael Bachelor. In TS1, Michael is a Libra, in TS2 he's an Aries and Leo. I just went with the original. I think you made a good call with his look. I lean more towards his Sim 1 looks as being accurate, because he has the same skintone as Bella there, the Sims 2 version seems like he was just phoned in with a generic Face 2, and Sims 3 is, well, Sims 3. :P I consider it an alternate timeline. I don't see how else to factor it in. I really love your photos. They're gorgeous. The one on the bottom right looks like one of those official EA Sim illustrations. It's the lighting, I think. Very nicely done. It's weird how TS1 Michael looks the most like Bella when I don't think they were even written to be siblings at that point. The TS3 timeline only works if you figure Michael went through a midlife crisis that inspired him to dye his hair, get a tan, chug ten gallons of the elixir of life, and head back to college...after which he still had no idea what to do with his life. Perhaps that's why he started going after younger women. They didn't even try with TS2 Michael. I think all the dead Sims are face templates or exact copies of their descendants. I noticed that Flamenco is just Dina as a dude and Jocasta is Bella with blue eyes. Thank you! I'm always concerned about lighting because I have a really old school monitor, so I'm never quite sure how it's going to look on other people's screens. I think you may have made the perfect Michael. For me the biggest shame isn't the face inconsistencies... it's the fact he's dead at the start of Sims 2! I reckon if he was an alive pre-made he'd be one of the most played characters in town! AHhhh! My favorite S1 character! Thanks!!!! A very handsome man, thank you. I have a little question due to the point that I already planned everything for Michael. Is he a young adult or adult? If he is a young adult I have to think everything over and over again. Wow, LJ did not send me a notification about this comment! This download is an adult, but you can make him whatever age you want him to be. Thank you, this Michael will fit rather nicely in my game! mike's eyes dont show up as bright as in your pictures. is that normal? Ooh, loving the idea, and the result! Any chance you can try a Holly Alto & Erik Darling conversion? I'd love having these guys for part of this Pleasantview: Next Gen series I'm gonna do (they'd be both in flashbacks AND their children). I could try tweaking her face a little more though. It's also hard to find the right hair color for her! Hope she works out for you! Good luck with everything! Hm. Do you know if there'd be a way to effectively replace the Michael Bachelors currently in my game (memories, tombstone, marital ties) with this one without ruining my game? This one's perfect, and the other two look nothing like I always imagined him. Or if you want to change the one in an existing hood, you could use the Sim Surgery tool in Sim PE to change his look, but you'd have to create another Michael in that hood to clone his appearance off of. I wish my game wasn't borked so I could download him! And off topic, I really hate captchas. It's like, please confirm you are human, by re-typing illedgible gibberish!